Focal adhesions are integrin-containing, multi-protein structures that form mechanical links between intracellular actin bundles and the extracellular matrix or substrate in many cell types . The formation and function of focal adhesions can be described over defined steps that include initiation, clustering, growth, maturation and disassembly. 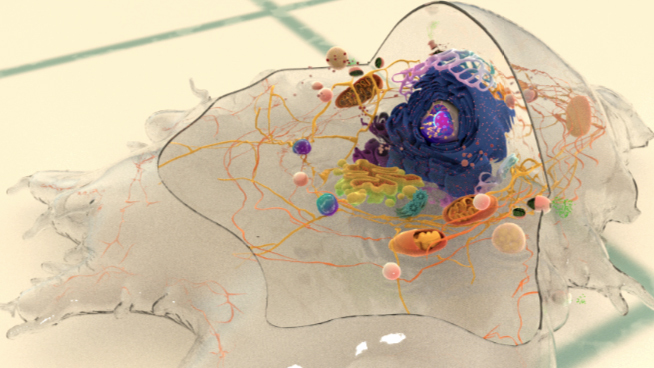 They are commonly found at the ventral surface of cells in 2-dimensional tissue culture and can be envisioned as the feet of the cell , which function as interactive information interfaces between cells and their environment. Studies show that new adhesions are formed at the leading edge of migrating cells, grow in size and mature as the cells move over them . During cell migration and spreading, focal adhesions serve as holding points that suppress membrane contraction and promote protrusion at the leading edge (reviewed in ). In stationary cells, they serve as anchorage devices that maintain the cell morphology. Focal adhesions (FAs) are highly dynamic structures that grow or shrink due to the turnover of their component proteins (commonly known as “plaque proteins”) in response to changing mechanical stresses (e.g. actomyosin-generated forces, external forces exerted by or through the surrounding matrix). While the adhesions originate at the cell periphery, they appear to move inward relative to the cell center as the cell migrates over it . However, the structures as such are largely stationary relative to the underlying substrate but for sliding and slowly changing position during disassembly and turnover respectively. 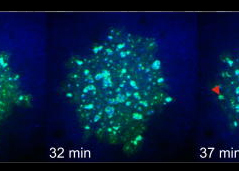 Their growth correlates with relative movement, while the composition and organization depends on changes in their microenvironment, demonstrated both in vitro  and in vivo . Unlike podosomes, FAs are long-lived upon maturation. The different stages of the focal adhesion lifecycle and corresponding force-dependent morphological changes are discussed in detail. Several components undergo turnover, such that early, nascent adhesions exhibit a high turnover rate and mature adhesions show increased stability. Focal adhesions are consistently found at the end of stress fibers and are therefore highly integrated with the bulk of the cytoskeleton. Consequently, focal adhesions serve to transmit force, internally generated by the cytoskeletal network, to the ECM and vice versa via adhesion receptors . 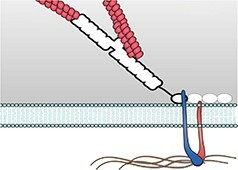 Adhesion assembly and maturation are highly dependent on the presence of force, which is believed to instigate structural rearrangements that in turn foster the recruitment of additional proteins (growth) and induce signaling cascades leading to actin polymerization (strengthening) (reviewed in ). Actin polymerization and actomyosin contractility generate forces that affect mechanosensitive proteins in the actin linking module, the receptor module (e.g. integrins), the signaling module, and the actin polymerization module . This leads to the assembly and modification of actomyosin stress fibres  that ultimately result in global responses such as directional movement, cell growth, differentiation and survival . Thus, FAs can be generally described as mechanosensory machines that are able to integrate multiple spatiotemporal cues, transducing and propagating these signals into multiple pathways (reviewed in ) that affect critical decision-making process at the cellular level . Focal adhesions have also been observed in physiologically relevant scenarios such as in endothelial cells on the rigid basal membrane of blood vessels, whose dynamics is modulated by shear-dependent matrix changes  and in Drosophila embryos,where FAs mediate surface-rigidity dependent development (reviewed in ). However, due to the challenge involved in visualization of FA dynamics in 3-dimensions , these are less well documented even when investigated using in vitro studies. From available data, it is known that FAs in 3-dimensions are generally much smaller and dynamic  while elongated ones are also seen . Future studies in this context will reveal potential adhesion-mediated cellular phenotypes and their role in physiological processes.